Put bread in a large mixing bowl. Add eggs, condensed milk, milk, raisins and apple. Mix well. Set aside for about 15 minutes to soak. Stir melted butter into the pudding mixture and transfer everything to baking pan. Bake for 25 minutes, remove from oven. Sprinkle brown sugar evenly on top. Bake for another 20 minutes or until firm and golden. It is a dessert, breakfast, or tea time snack. Bread pudding is crispy on top, creamy and soft inside. It is a good way of using up leftover bread, but it is versatile, nothing can really go wrong. 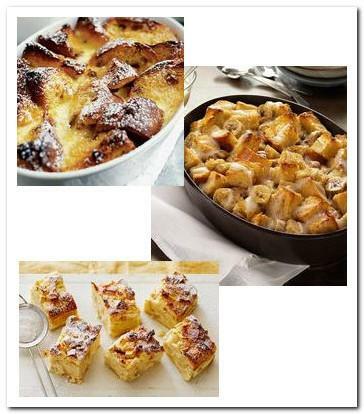 Top with fruits or ice cream, bread pudding is a dessert that makes people happy with minimum effort.